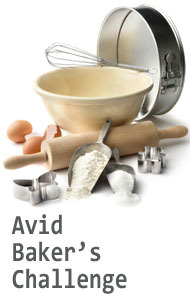 Welcome to the Avid Baker's Challenge, or ABC, a monthly baking group. How does it work, you ask? We bake 12 recipes from one recipe source, one for each month in the year, before we move on to a new recipe source. This can be either a book or an online recipe source. The club admin (yours truly) gets to select the recipes we bake each month. The posting due date for ABC is as easy as 1-2-3. As an ABC baker you're free to choose one of the following posting dates: the 1st, 2nd, or 3rd of each month. During the first three days of each month, we'll all post our experiences and photos of the baking project. Anytime we bake recipes from a book (a hardcopy), we never post the original recipe, because we'd like to encourage everyone to buy the book. In recent years, we've been baking from online recipes that are readily available, in which case it's acceptable (and even encouraged) to add a link to the recipe. We're also on Facebook. If you don't have a blog, please feel free to join us every month on the ABC Facebook group. When you write up your post, please add a link to your post using the Linky tool on the ABC blog. Should you be late and post after the 3rd that same month, I still encourage you to blog about the recipe and add a link to your post on the ABC blog. The Linky tool will remain open and accept blog post links until the 15th of each month. If you'd like to join us in this baking adventure, please feel free to email me at HanaasKitchen [at] live [dot] com. This year, we'll baking from David Lebovitz' blog. As some of you know, David is a professional cook, baker and cookbook author, living in Paris. Having baked some of his recipes in the past, I'm looking forward to doing more of that with all of you. It'll be hard to select "just" 12 recipes :) Happy baking! In 2017, we are baking from Deb Perelman's blog, aka Smitten Kitchen. I like her variety of recipes, from sweet to savory. Happy baking! In 2016 we will be baking from a new online recipe source that I'm very excited about: "Weekend Bakery", http://www.weekendbakery.com They offer a variety of recipes: breads, rolls, cakes, cookies, you name it. Happy baking! The results of the survey on the recipe source for 2015 showed overwhelming support for Christina Marsigliese's blog, Scientifically Sweet. Although she published a recipe book, we will be using the recipes that are on her blog. I have no doubt you'll want to buy her book after the bake-along (I have it and it's awesome!). A brief survey indicated that we all enjoyed baking from the King Arthur Flour website. So much so, that we'd like to bake from it one more year. In 2013 we will be baking from a recipe website this time, not a book (to change things up a little bit). And the survey winner is: www.KingArthurFlour.com. We, the ABC bakers, are in no way affiliated with King Arthur Flour. For the year 2012, the decision has been made to bake from The Weekend Baker by Abby Dodge. We, the ABC bakers, are in no way affiliated with Abby Dodge. We're just fans of her books. We all enjoyed baking from Baking for all Occasions so much that we decided to bake from it some more. For the year 2010, the decision has bee made to bake from Baking for all Occasions by Flo Braker. We, the ABC bakers, are in no way affiliated with Flo Braker. Hi,,I was directed from the site Lethally Delicious. Im glad i took a peek. Sounds like allot of fun. I love trying new recipes,,,and it looks like a realistic challenge to complete one a month as apposed to one a week. Hanaa - I just ordered this from amazon.co.uk. I hope it will arrive in time to bake with you in Feb! Great to have you on board, Lois. Welcome to ABC!! Just ordered the book. I'll be glad to try new recipes with your great baking event! Lovely bake - as usual, Hanaâ! I admire your health consciousness - I went for the buttery and creamy. I didn't experience any problems with too sticky dough (used AP with some whole wheat). Since I changed several things in the recipe, I posted the whole procedure, too, but re-wrote it completely. I couldn't find a "post your link" option, but you have my post in your ABC Blog Roll, anyway. Greetings from in Lübeck/Germany - we are off to the Baltic Sea today. I'm ready to bake :) can I have an invite to group please and thank you!!! Do you have to have a blog to do this? Where else would one post? You could bake along without a blog but that would make sharing your pictures and experience pretty hard (or impossible). Creating a blog is pretty easy and quick. Just follow the instructions on www.blogger.com. I hope you can join us! Well whaddya know -- I already had an account. So I created a blog, but only the basics for now. I'm going to try to make the muffins tomorrow. Gotta go get the fruit soaking. Is there anything else I need? Is there a formal invitation required? Great! You're all set then. After you write your muffin post, come back to the ABC blog and leave a link to your muffin post. That's it. If you'd like to add a cool ABC badge to your blog to let your visitors know that you're part of ABC, please email me and I'll send you the badge. BTW, just so you can keep my personalities straight ;) I am that original "Anon" up there, and Maxine (my kitty, who passed away last year.) I went ahead and changed my account to my first name, but I might change to my blog name, Dos Gatos Baking. Still figuring this all out. Hellooooo! Anyone home?? :D Looking for the March posting spot and maybe the next couple months of recipes. Hi, Hanaa. got here from Karen's Kitchen Stories and would love to join in. Love KAF recipes. Would have loved to make the gruyere bread. And of course I will just for the fun of it. Hi TeaLady. Please feel free to join. I'll add you to the blogroll as soon as you bake with us and add a link to your post on the ABC blog. Happy baking! hello Hanaa this Rosa maggie I'm not sure about this because if I have to buy a cook book that you use then I can't.... P.S. I have all of Rose Levy Beranbaum cook books. I started a blog not too long ago and would love to join this group since a monthly baking challenge is very appealing to me, but I notice only 2 more recipes have been chosen for the rest of the year....are there plans to continue the group beyond 2013? Thanks for the quick reply, Hanaa. I'm very glad to hear the group will be continuing; I've followed the group from time to time since it began and actually purchased Flo Braker's book because of the amazing results I saw. I'll definitely be joining in and I am tempted to start with those hand pies - they look fabulous! Hi Hanaa! I would love to join your baking group as well - 1 recipe a month sounds perfect to me, and I love the KAF website! P.S. I'll be late with the October posting -- I was out of town and now I'm under the weather. Hopefully next weekend. The concept sounds amazing but I don't have the book . How do I join? I would love to join the Avid Bakers Challenge! Please let me know if I can. Excellent! Thank you! Not sure how to use the Linky tool, ill give it a try! كما ان افضل وارخص شركة نقل عفش بالمدينة المنورة تضمن لك حماية كاملة للعفش الخاص بك وذلك من خلال استخدام معدات آمنة وحديثة إضافةً إلى استخدام سيارات نقل بانواع مختلفة واستخدام اوناش باحجام مختلفة إضافةً إلى اعتماد الشركة على فريق عمل مميز وذا خبرة فإن هذا كله من أجل توفير الراحة التامة للعميل.